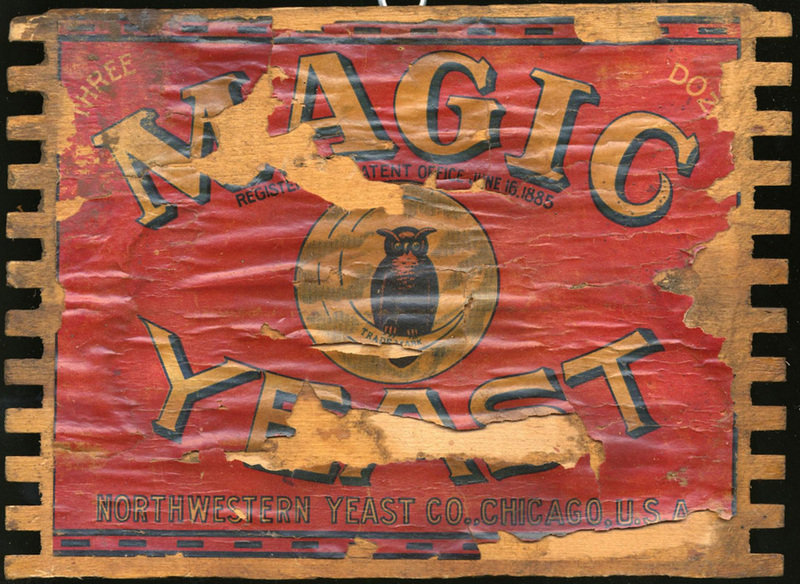 The Northwestern Yeast Company, in Chicago, was the market leader in yeast around World War I. The original company at Northwestern Yeast’s location was the George A. Weiss Malting and Elevator Company, which started operations in 1884. 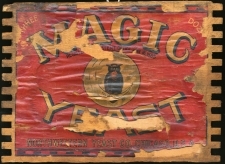 This particular scrap of paper is likely an insert from a Magic Yeast package. It’s got a lot of advice, but let’s focus on two items in particular. First, root beer. This method does work, and sometimes it’s done as a science experiment in college chemistry labs. It’s actually much closer to the earlier forms of root beer than most. In the 13th century, people in England observed that those who could afford to drink fermented drinks were often healthier than the poor who had to drink unclean water. The reasons were unknown at the time, but involved both the fact that boiling the water is a step in brewing and that the alcohol might slow the growth of any pathogens that find their way in. At the same time, children (and women, who were thought to be delicate) couldn’t be expected to drink beer all day without certain, possibly hilarious, but entirely undesirable side-effects. Probably singing. Brewers started to produce small beer, which was a version with greatly reduced alcohol, either from re-using the spent mash of a regular run of beer or by using smaller quantities of yeast and shorter fermenting before consumption. While alcohol is present in these beers, if prepared correctly, the amount present should be about a ninth or tenth of what is present in a normal beer, a lot like the “no-alcohol” beers sold today. By the 18th and 19th centuries in America, root beer was a class of these small beers prepared with flavoring extracts from roots, herbs, or berries. So what they’re proposing here isn’t that shocking. One caution, though–refrigerating the bottles will put the yeast back to sleep and stop the fermenting process. If you fail to refrigerate them, the yeast will keep converting sugar into alcohol (yay!) and carbon dioxide (boo). The carbon dioxide will ultimately cause your bottles to pop their corks/tops or explode. But the second item here is a little bit more troubling. Don’t eat cakes of live yeast. While yeast is, indeed, a great source of many vitamins and is sold as a supplement at the health food store, the yeast they sell there is dead. Or “spent” or whatever other euphemism they use at the store to convince you to swallow a tablet of yeast that is no more, has ceased to be, has met its maker, has run down the curtain and joined the choir invisible. Some sources say your stomach acid will kill yeast. Fun fact: the average pH of your stomach is less acidic than root beer. And we already know yeast love that. Other types of yeast are very happy in your body and this yeast likely would be, too. It won’t kill you, unless you’ve got an allergy of some kind, but it’ll make you awfully gassy and taste like a giant mouthful of yeast. Whatever your health problems are, gastric distress will not cure them. But if you’re looking for somewhat more defensible ideas for yeast, the booklet this pamphlet advertises, The Art of Making Bread, is online. The company seemed to have some antitrust problems in the 1940s and was sued by employees who claimed to have not been paid for overtime. I haven’t found its ultimate fate, but the factory was sold by 1950. 1 (3-oz.) bottle Root Beer Extract. 5 gals. pure fresh water, slightly lukewarm. Soak 1 cake Yeast Form 1/2 hour in 1 qt. lukewarm water. Place in crock 4 lbs. sugar, one 3-oz. bottle Root Beer Extract and and 4-1/2 gals. lukewarm water. Strain soaked yeast thru cheesecloth. Rinse yeast left on cloth thor’oly with 1 qt. of water. Throw away solid particles. Add dissolved yeast and rinsing water to mixture in crock. Mix well and bottle at once. Fasten corks securely. Keep in warm place 6 days. Cool. Store in cold place. To be “ready” in less than 6 days, use 2 or 3 cakes of yeast and let stand 3 or 4 days before cooling. Yeast Foam is a corrective food which helps keep you fit. Take it if you suffer from constipation, boils, pimples, indigestion, auto-intoxication, run-down condition, etc. Easy to eat. Crumble a cake over your cereal in the morning. Spread with butter or jam like a cracker. Break and soak in glass of water or fruit juice. 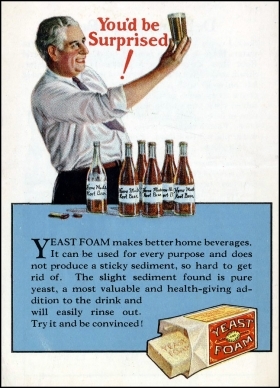 Any way you take it, there’s health and vigor in Yeast Foam. For other recipes and information concerning yeast, send for our free descriptive booklet “The Art of Making Bread.” Use this coupon. All measurements are level. Four loaves. In the evening, break and soak yeast 20 minutes in lukewarm water. Mix with flour to thick batter. Cover. Let rise in warm place over night, 78 deg. F. Potatoes may be used in this sponge if desired. Early in the morning mix sponge with water, salt, sugar, and lard. Add flour and mix to medium dough. Knead about 10 minutes; let rise until doubled. Knead down again; let rise about 1 hour. Mold into loaves; let rise to double size, bake 45 to 60 minutes in moderate oven. Have all materials moderately warm. Avoid dough becoming chilled. Part of this bread dough, when ready to be shaped into loaves, may be made into plain rolls, Parkerhouse or Cinnamon rolls. Baking at home is much cheaper and so easy, too. Just follow our recipes carefully and you will surely be delighted with the results. Hannah L. Wessling, formerly with Department of Agriculture at Washington, is head of our Home Economics Department. Write her at 1750 N. Ashland Avenue, Chicago, for any information concerning bread, rolls, etc. 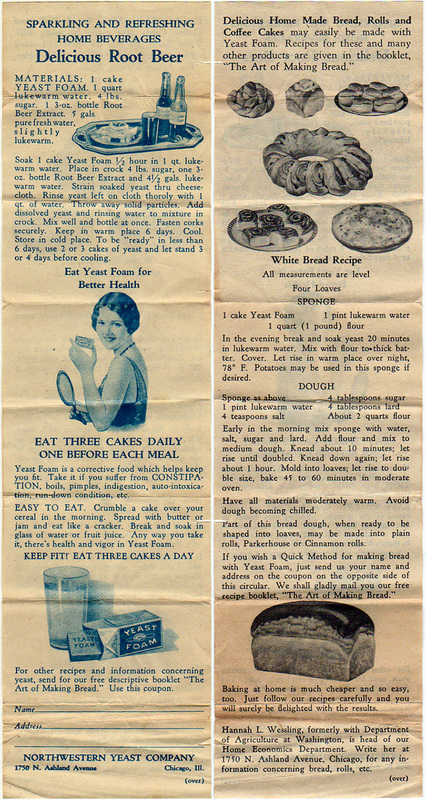 I found a brochure for the Northwestern Yeast Company on how to make bread without kneading while sorting some old family recipes. Love the advice to save the potato water from lunch. Would be happy to send you a jpeg. I have this booklet and most of the recipes call for some portion of a packet of Maca yeast. What quantity is this equal to in order to use the recipes with currently available yeast? Trying to google the information results in a lot of largely useless, (to me) information on yeast infections. I have found a book of the art of making bread by your co and wondered if you had any more books !!!!!! I have the vintage newspaper and found a yeast foam will grow in great condition and arrested below . There’s also a second recipe but has a piece missing. Is there any value or is there a collector that would like it?